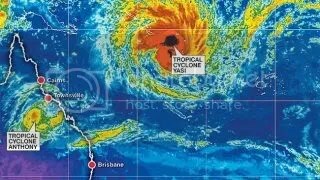 Yasi will cross the coast Wednesday night and is expected to gain momentum and strength. It is currently a category two and predicted to be a category four on touchdown. Looking at the WeatherChannel site you can watch the movement of the cyclone. To me it looks like a giant comet is about to crash onto the coast. Obviously there hasn't been enough damage yet. Early experience of the effects of global warming, anyone?